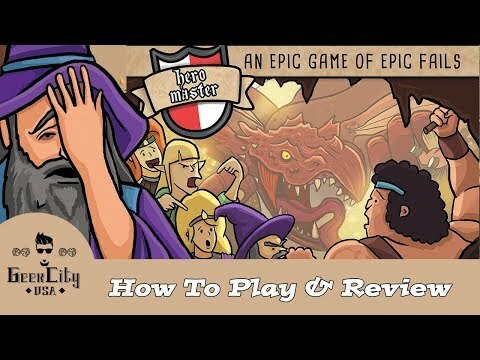 Hero Master is a dungeon crawl parody, where you each take on the role of a bungling hero aiming to make their fortune. They might think they're contributing to a solid adventuring party, but these heroes are so inept, they're more likely to trip one another up than use a teamwork take-down on a monster! Using a really simple parody of the D20 dice system for combat, players place attack cards at encounters with monsters and hope that their fellow heroes don't follow up by placing a bungle card to scupper their plans! Players start the game by drawing a race and a class and combining a mini-deck of (11) cards from the innate traits and special moves for their character. For instance; the barbarian is great a weighing in and chopping around with his axes (watch out for those!) but he also has a nasty habit of standing directly in everyone's way... "Huh!?" The human, as vanilla and forgettable as can be just bores the entire party senseless, much to the despair of the utterly intolerant wizard. The elf (considering himself the greater race) simply wants to go first all the time. All of these amusing and familiar fantasy tropes are packaged as a series of amusing skills and flaws that can be used to get the edge over your opponents. Combining this with the chuckle-worthy treasure you find along the way will create a feeling of mayhem and silliness, particularly when someone rolls a critical fail... (which is actually mostly a positive thing for you, less so for your party... who wants to be standing next to you when you're flailing around with an axe?). We've been testing the game for the past two years- in that time it's evolved a lot. Although the mechanics and rules are fully realised, we are continuing testing to balance the game, The game plays really well with close finishes and "please roll a 20" last throws of the dice.